WASHINGTON, DC.- The Smithsonian’s National Museum of the American Indian celebrates one of Mexico’s indigenous communities with the unveiling of “Vochol:Huíchol Art on Wheels” in the museum’s Potomac Atrium Tuesday, March 20. This singular piece combines Huíchol culture with a pop-cult icon, the Volkswagen Beetle. 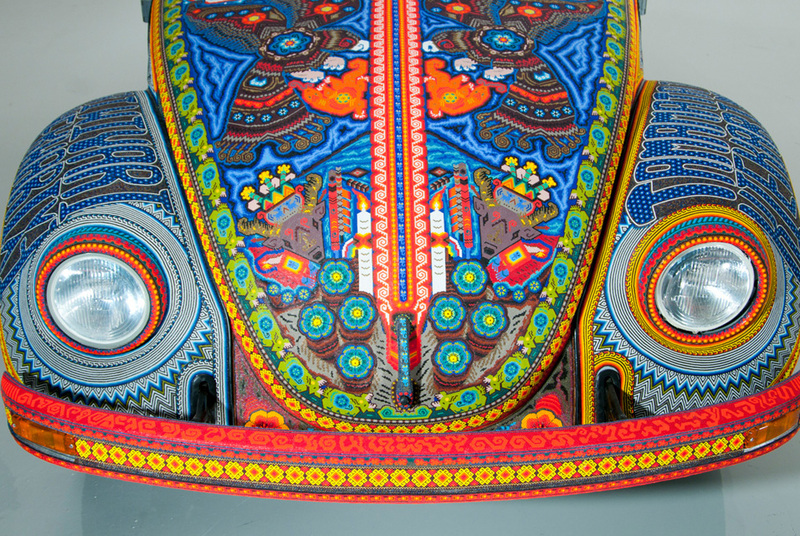 Two families of Huíchol artisans devoted more than 9,000 hours transforming the “canvas”—a 1990 Volkswagen Beetle—into a stunning juxtaposition of modern machinery decorated with bright, psychedelic patterns and colors. More than 2 million glass seed beads and nearly 35 pounds of fabric, paint, yarn and resin adorn the vehicle’s chassis and interior, including the seats, steering wheel and dashboard. It is the first Huíchol object of art on wheels. Its name derives from “Vocho,” a slang term for the VW Beetle in Mexico, and “Huíchol,” the common name for Mexico’s indigenous Wixaritari (“the people”), a community of approximately 26,000 people who have settled in the mountainous region of the western Sierra Madre. The Vochol’s beadwork and embroidery illustrates powerful symbols, milestones and stories from the deeply spiritual culture, including images of deer—the most revered animal—and a two-headed eagle marking the four cardinal directions, as well as the fire, drum, squash and corn used in a traditional maize-offering ceremony. For the Huíchol, creating art—in the form of beadwork, textiles, stone sculptures, ceremonial objects and pipes—is not merely decorative. It is an expression of faith, evoking centuries-old shamanism and peyote rituals that are still practiced to this day. Work on the Vochol began in 2010 as a collaboration between the Museo de Arte Popular, the Association of Friends of the Museo de Arte Popular, the Embassy of Mexico and the Mexican Cultural Institute, as well as the states of Jalisco and Nayarit. The Vochol will be on view through May 6, before continuing its international tour at esteemed institutions, including the Musée de Quai Branly in Paris. The tour will conclude with the international sale and/or auction of the Vochol, with all proceeds donated to the Association of Friends of the Museum of Popular Art to further its mission of safeguarding and promoting the work of Mexican artisans. The Vochol on its way to Washington, D.C.
Artículo siguienteColecta del dia del niño "Chihuahua"